A few years ago, I read a Country Life article on Tom Parr and his partner Klaus Scheinert's garden in the South of France. 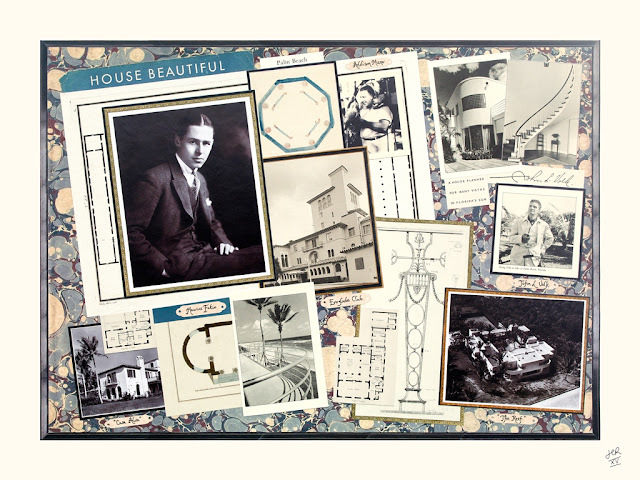 The article was published in 2013, two years after the death of Parr, who, as many of you know, was the former director of the venerable London design firm, Colefax and Fowler. While the Country Life article was a keeper (meaning I clipped it for my tear-sheet library), I was left wishing that I could see photos of the home's interior. Thankfully, someone gave me a 1997 issue of House Beautiful that happened to feature Parr and Scheinert's house, interiors and all. Located near Grasse, the house, named "La Casella", had been built in the 1960s and was patterned after an 18th-century pavilion built for Madame de Pompadour. 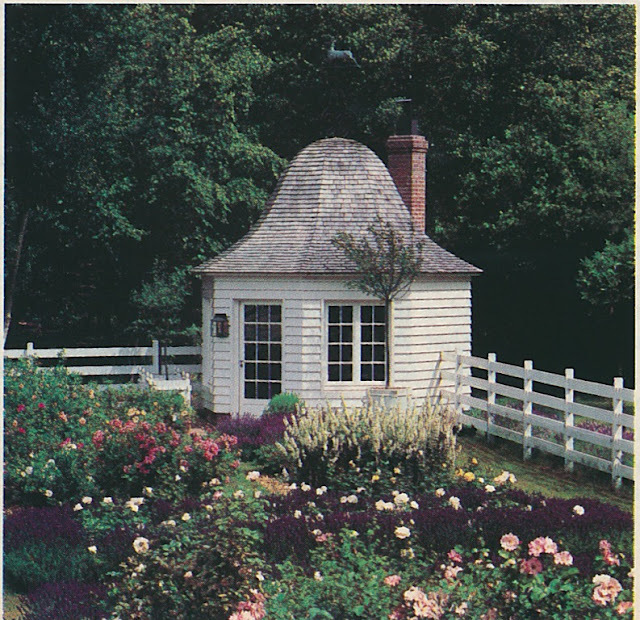 By the time Parr and Scheinert purchased the house in the Eighties, the house was in sorry shape, a "rather unloved, rather down-market place," according to Parr. 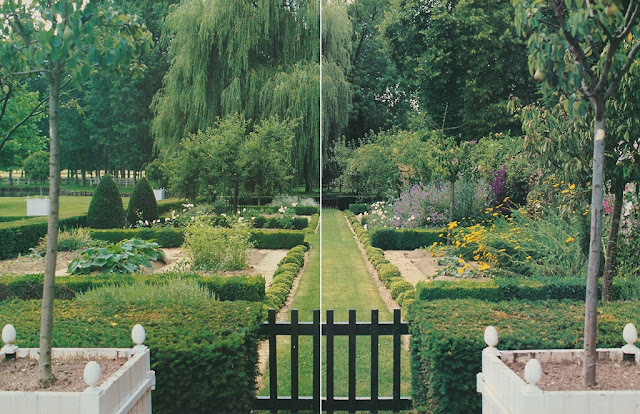 Equally as unloved were the adjoining gardens, which once supplied jasmine to the perfume industry. 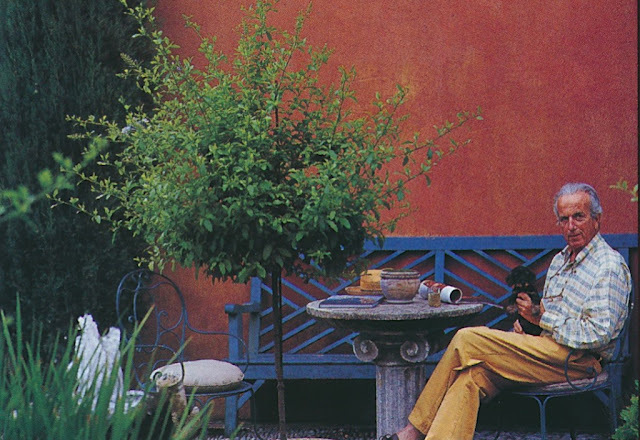 But after Parr's overhaul of the interiors and Scheinert's revamp of the gardens, La Casella was eventually transformed into a haven of comfortable good taste. 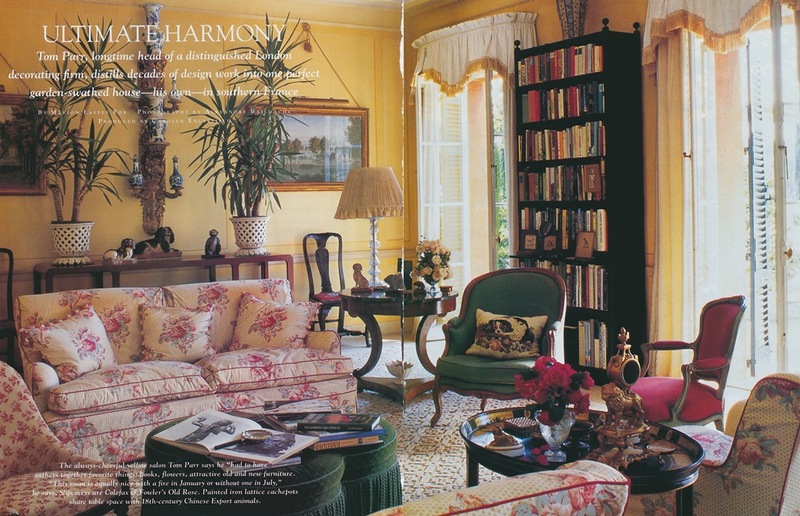 Fans of the English Country House style should be pleased by the home's interiors, which were lavished with Colefax and Fowler fabrics, including old favorites such as Old Rose (seen above in the yellow salon, the room which perhaps best reflects Parr's inimitable style,) Bailey Rose, and Floral Toile. 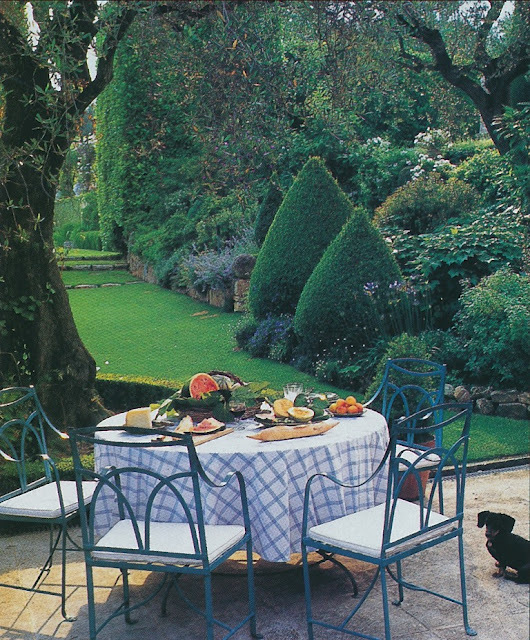 Others will likely be enthused by La Casella's enchanting gardens. 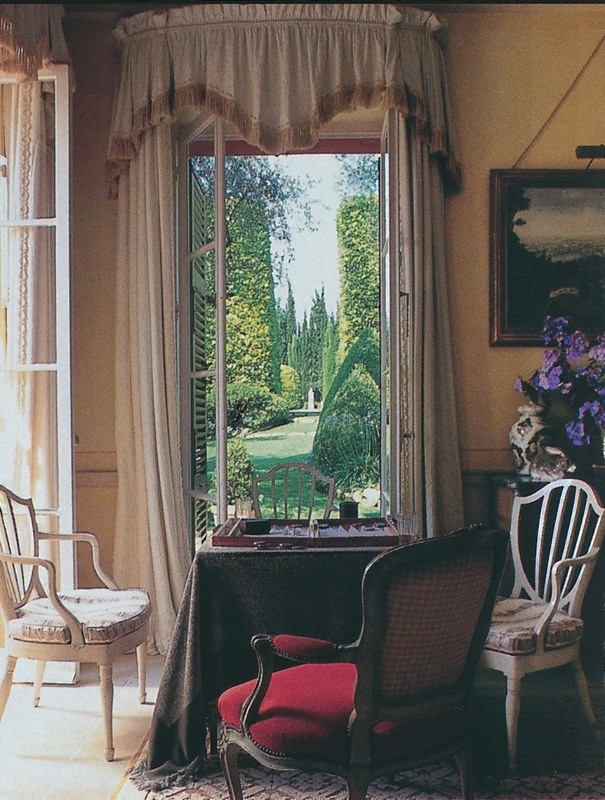 (If you'd like to learn more about the gardens, you should read Robin Lane Fox's article for FT.) But what impresses me is the confidence with which Parr decorated his house, choosing fabrics and furnishings of which he was certain he would never tire. 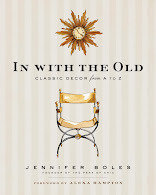 "I might do fresh new slipcovers, but I'm certainly not changing any of the patterns," said Parr. "They will all be the same forever. They work. I love them. And if they weren't exactly right, I wouldn't have chosen them in the first place, would I?" A handsome Parr on the terrace of La Casella. 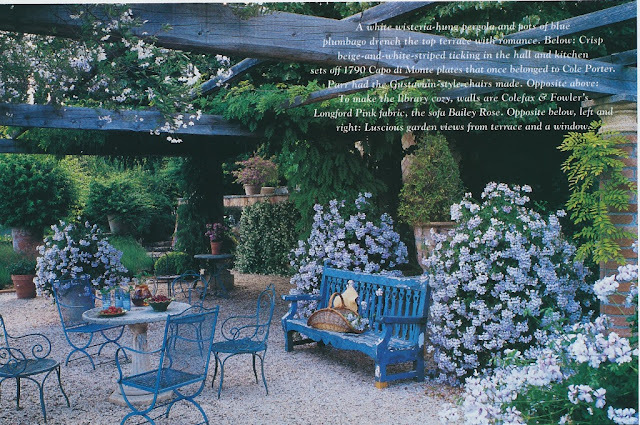 White jasmine and wisteria on the terrace of a guest cottage. 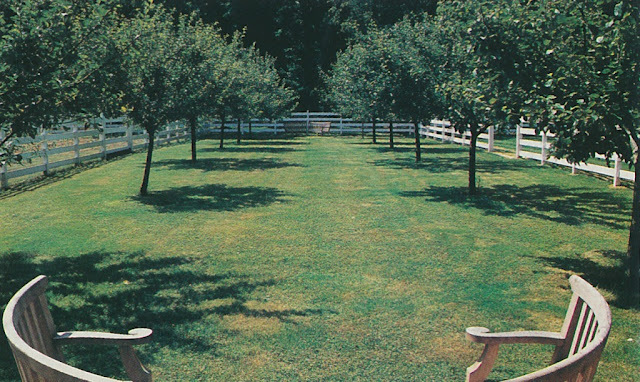 A view to the garden. 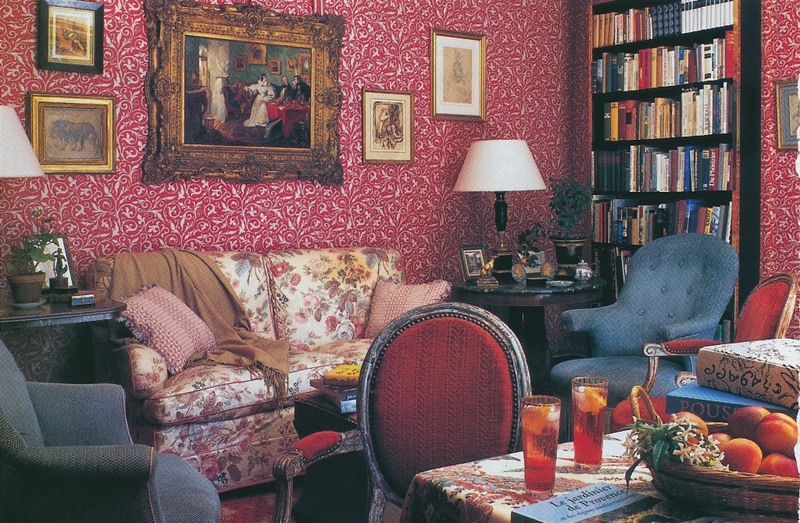 The walls of the library were covered in Colefax and Fowler's Longford Pink fabric, while the sofa sports Bailey Rose. The walls of the hall and kitchen were treated to classic ticking. The Capo di Monte plates formerly belonged to Cole Porter. 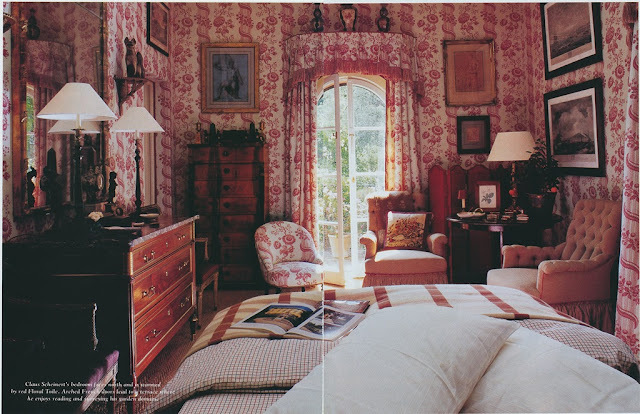 Red and cream Floral Toile envelops Scheinert's bedroom. 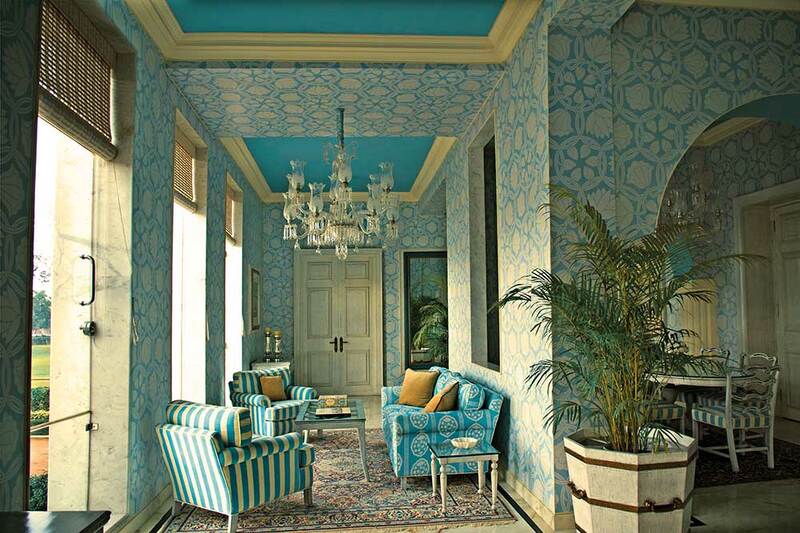 Yet another terrace, punctuated by blue and white. A terrace table set for dining. 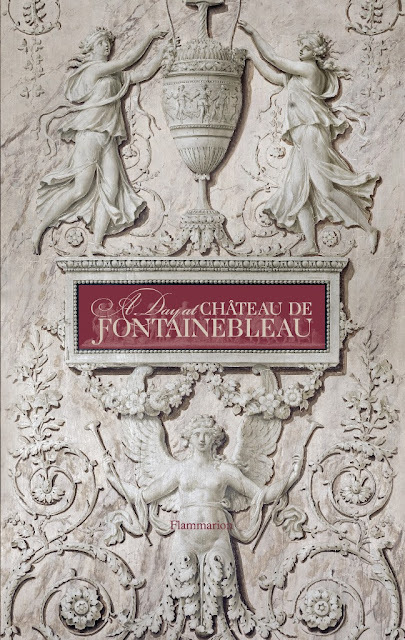 Earlier this month, Flammarion introduced the newest addition to its well-received series of French landmark-focused books, A Day at Château de Fontainebleau, which joins the previously published A Day at Château de Vaux-le-Vicomte, A Day at Versailles, and A Day with Marie Antoinette. While the "A Day at..." series' slip-cased format and bijou-size make these books enticing to collect, it is their concise yet nonetheless engaging text, not to mention their gorgeous photos, that make this series a worthwhile read. 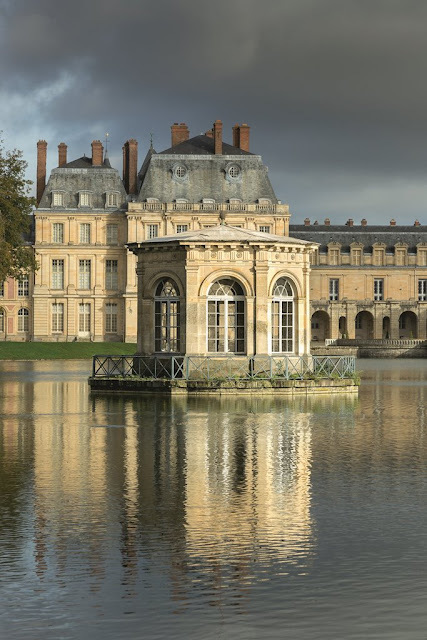 Akin to a private tour, A Day at Château de Fontainebleau, written by Guillaume Picon with photography by Eric Sander, gives readers an up-close view of this former royal residence, once home to the likes of François I, Louis XIV, and Napoléon. With its many photos of the palace's sumptuous details and its sometimes intimate though often sweeping architecture, the book makes it crystal clear why this château has earned its reputation as one of France's architectural gems. 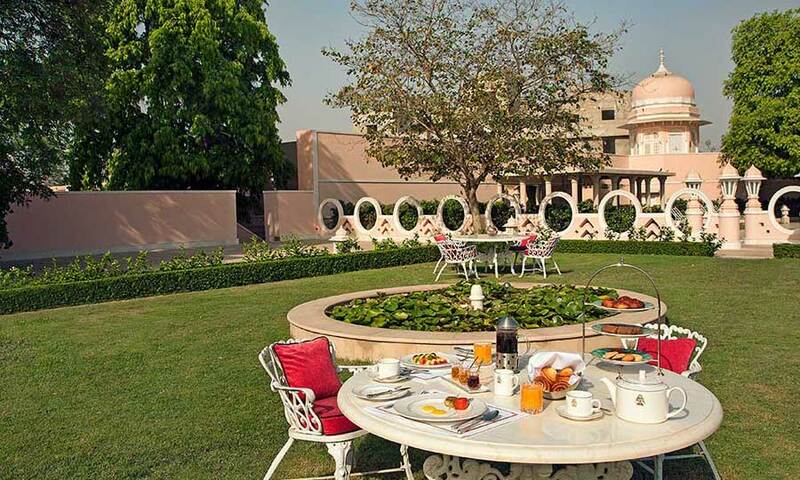 And if you do as I did and devote a cozy afternoon to reading the book in its entirety, you'll not only find yourself the wiser for having read it, but you'll feel as though you spent a few grand hours within the confines of a most magnificent palace. 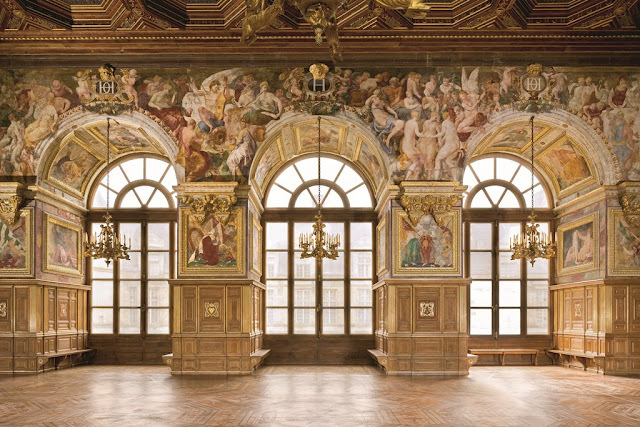 Begun under François I, the loggia was converted into a ballroom by Henri II. The frescoes were painted between 1550 and 1558 by Niccolo dell'Abate and his team, after drawings by Primaticcio. 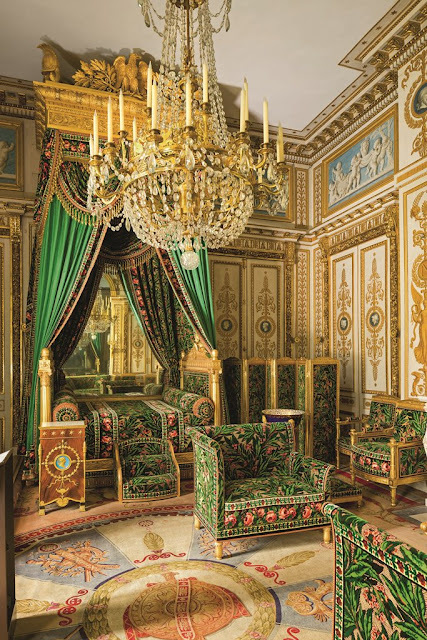 Bedchamber in the apartments of Madame de Maintenon. 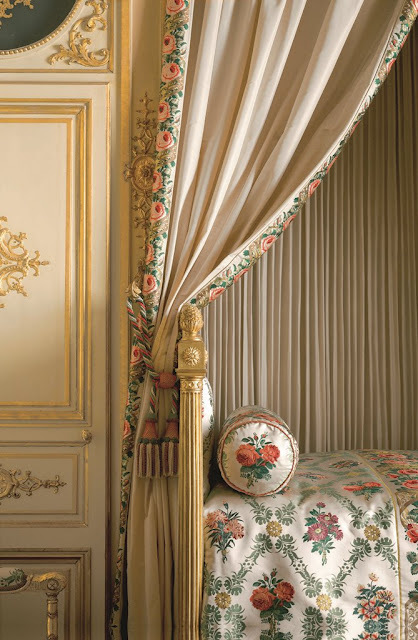 The bed was supplied for Madame Élisabeth, daughter of Louis XV. The Emperor's Bedchamber, with his giltwood state bed covered in plum-covered velvet with a pattern of flowers and laurel leaves, rewoven in Lyon in the late twentieth century to match the original fabric. In 2014, the Imperial Theater, inaugurated by Napoleon III and Eugénie and closed for the last 150 years, was opened to the public once more. The Pond Pavilion, built by Louis XIV and restored under Napoléon Bonaparte. All images ©Eric Sander, from A Day at Château de Fontainebleau (Flammarion, 2015). 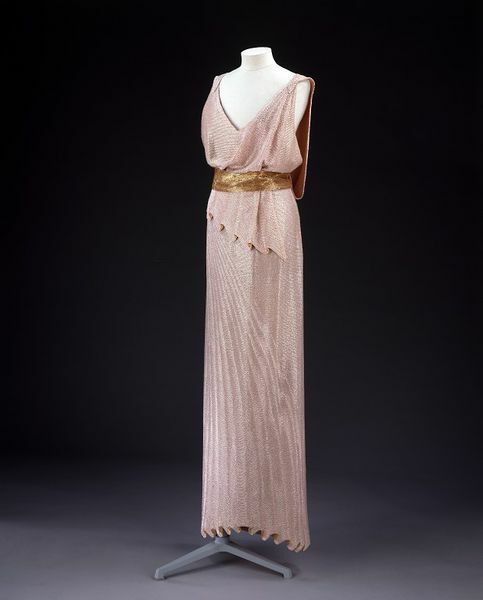 With Paris Fashion Week quickly approaching, it seemed fitting to take a step back in time- specifically, the late 1920s- to see how the late couturier, Jean Patou, lived. 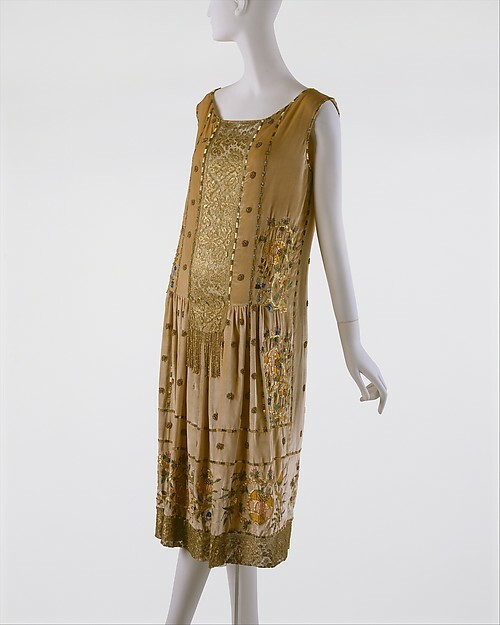 Although perhaps not as well-remembered today as his rival, Coco Chanel, Patou was one of the leading couturiers of the Twenties. 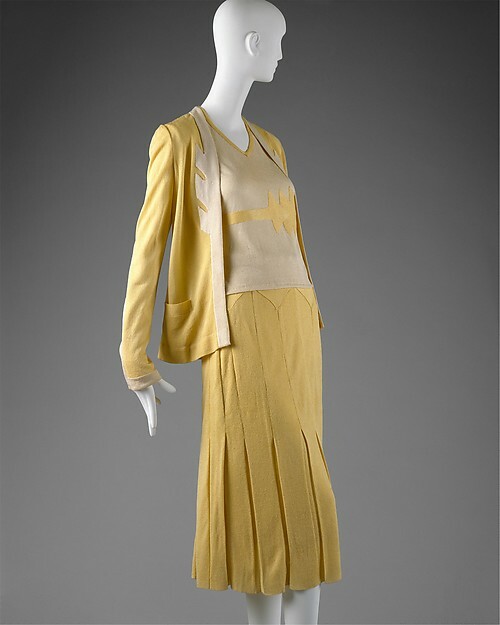 An early advocate of sportswear, Patou gained a following that included some of that decade's most stylish women, including tennis great Suzanne Lenglen and Lady Diana Cooper. A savvy businessman with a nose for marketing, Patou cut quite a dashing figure throughout Paris, earning a reputation as a stylish man-about-town. 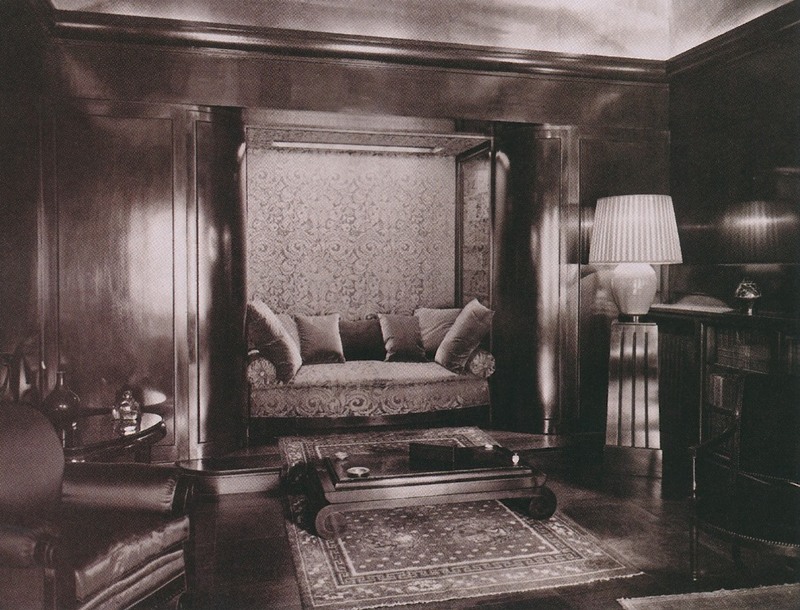 It was to be expected that the couturier would choose to live in surroundings that were just as chic as the image he projected. 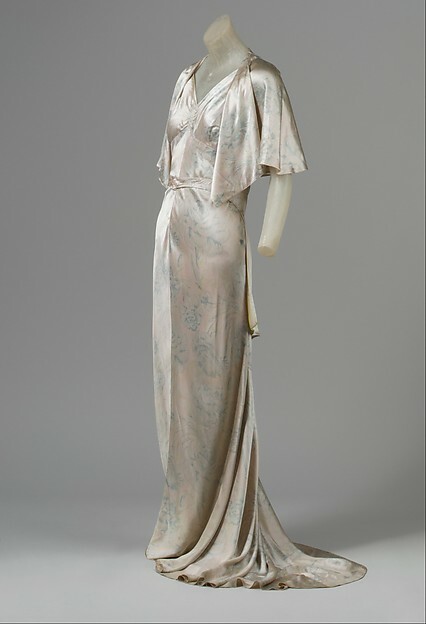 It was during World War I, when serving as a captain in the French army, that Patou met two fellow officers who, according to design historian Stephen Calloway, had a profound influence on the young couturier's burgeoning style. 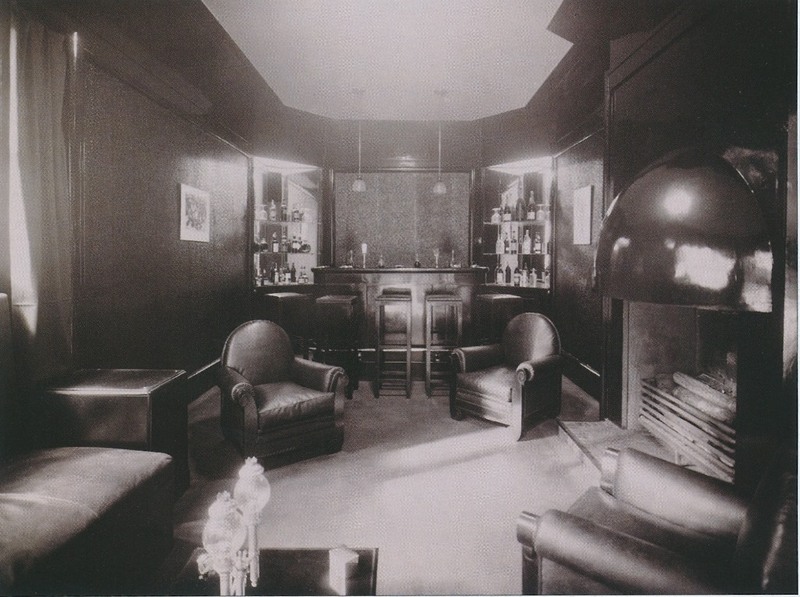 One soldier was Bernard Boutet de Monvel, the artist and aesthete, while the other was architect and decorator Louis Süe, who, after the war, formed a design partnership with André Mare. 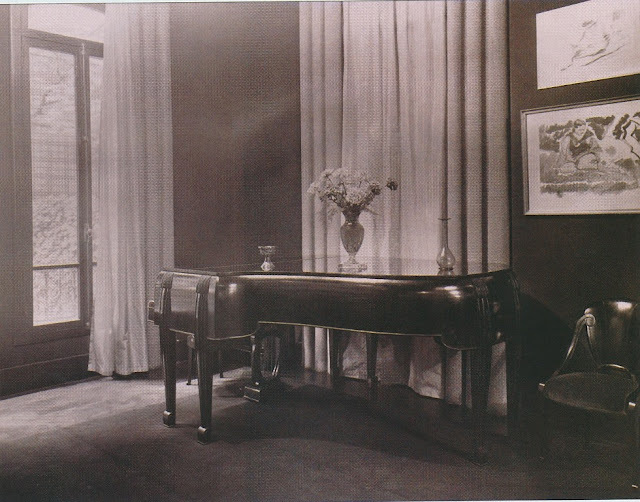 In post-World-War-I France, Süe et Mare were two of France's most fashionable interior decorators, assembling a coterie of sophisticated clients seeking their sumptuous brand of chic. One of those prominent clients was Patou, who enlisted Süe et Mare to decorate his 16th arrondissement hôtel particulier, which can be seen in these late-1920s photos. 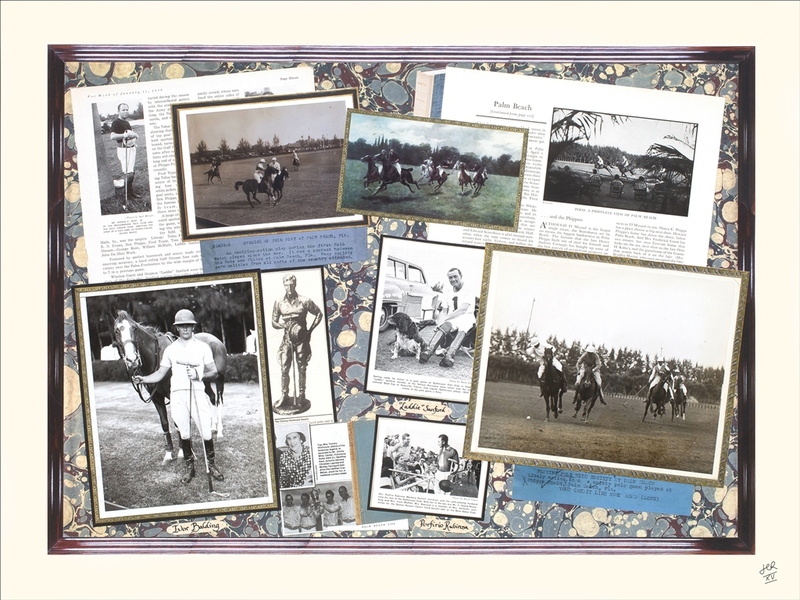 Scattered among these archival photos are images of some of Patou's fashions, further proof that Patou's house was just as modish as the House of Patou. 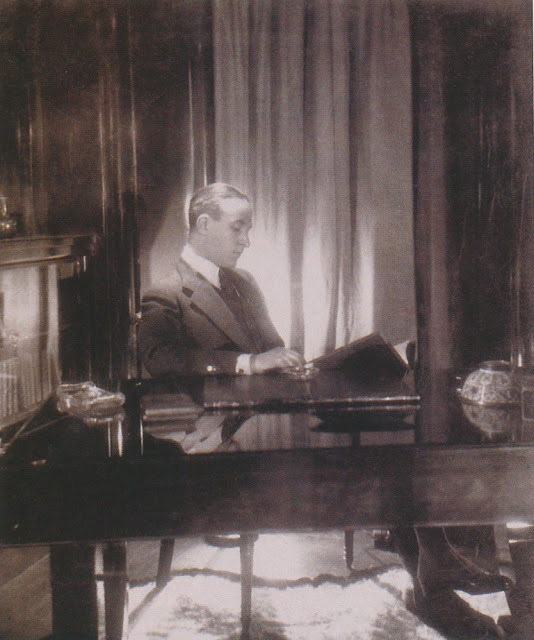 Image at top: Jean Patou in his study. 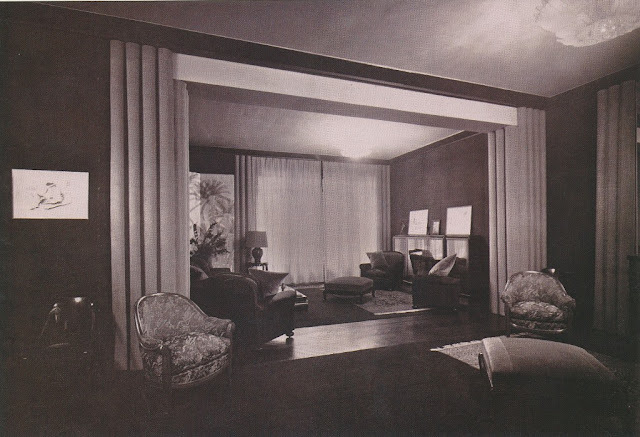 Patou's Süe et Mare-decorated living room. One area of the living room was designated for music. Like most of the home's furnishings, the piano was designed by Süe et Mare. 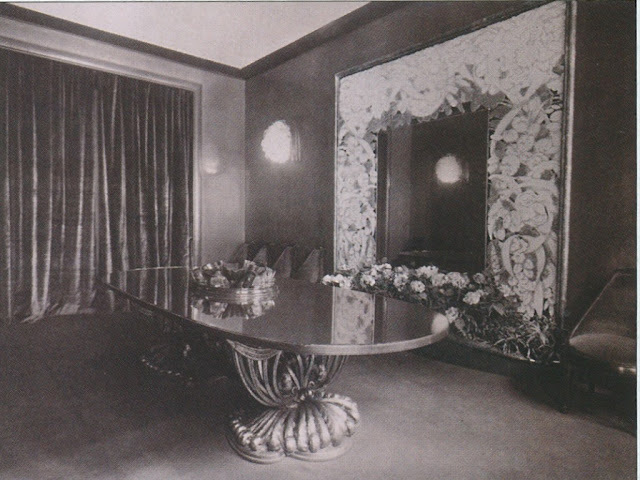 The dining room, which had yellow walls topped by brown stucco molding. The bar, which opened onto a garden. 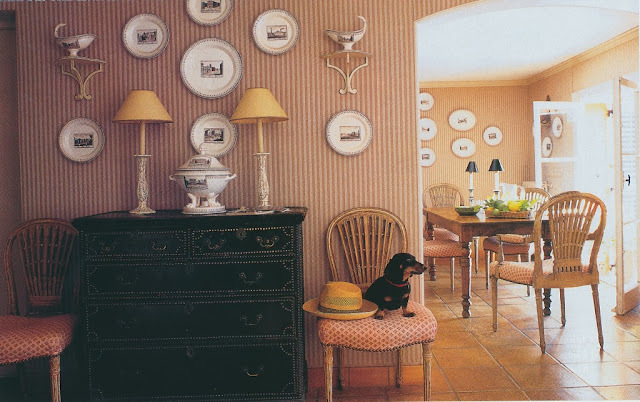 The chairs were designed by Süe et Mare. The mahogany-paneled study. 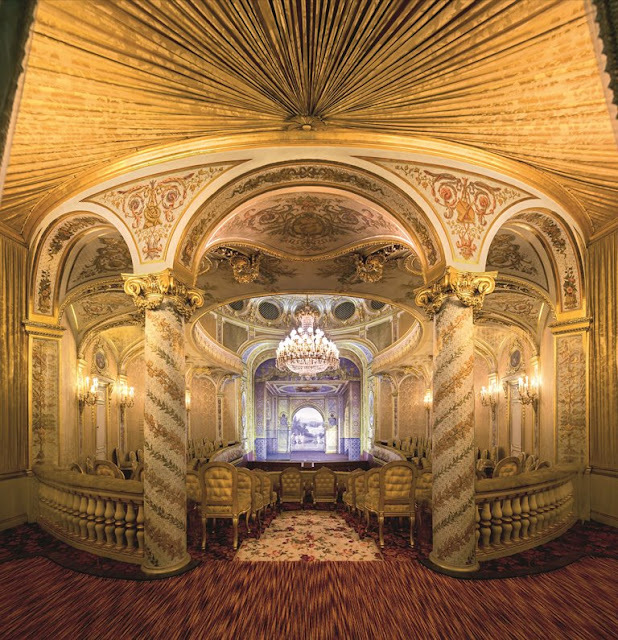 Mare was responsible for the alcove, which was lined in damask. The staircase that led up to the second floor. 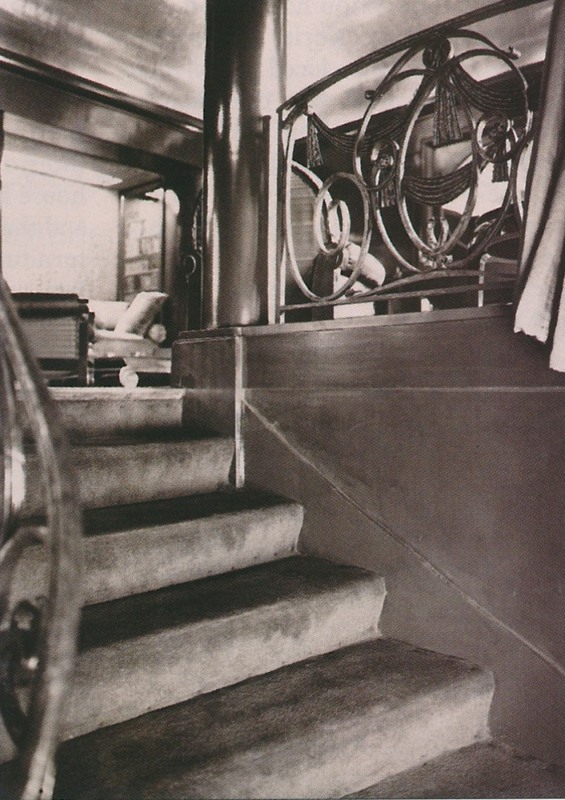 The intricate metal banister was designed by Richard Desvallières. 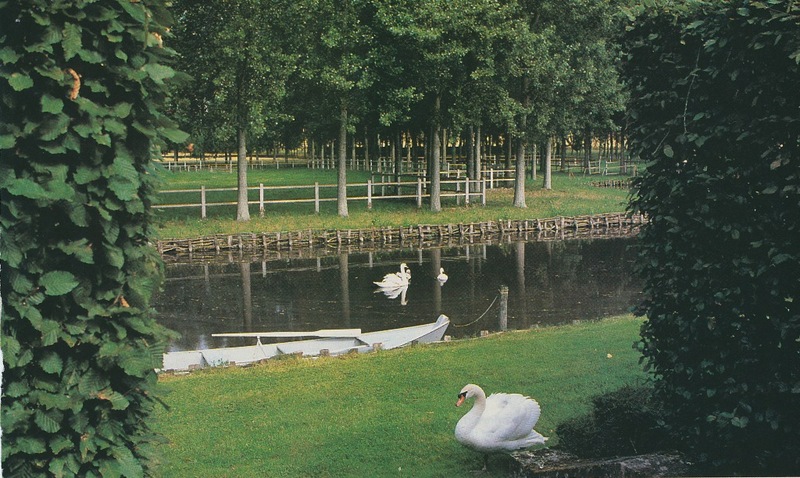 Patou's bath. 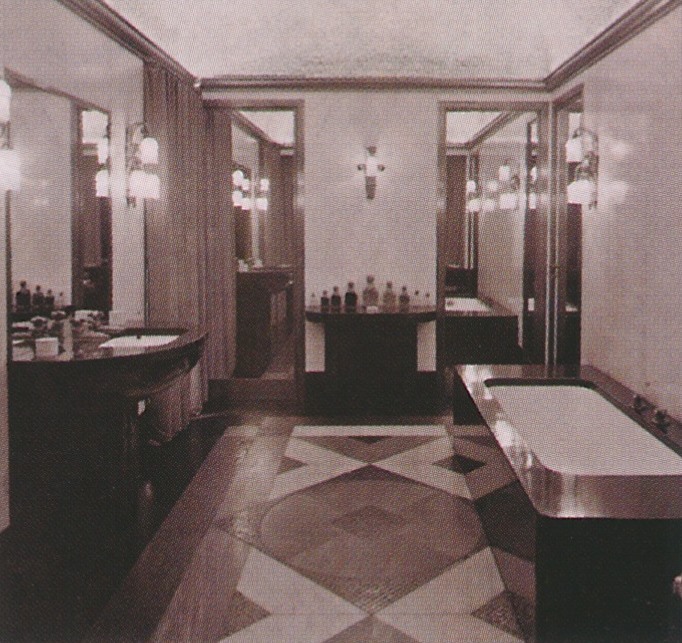 The walls and tub were faced in marble, while the patterned floor was blue, gold, and white. 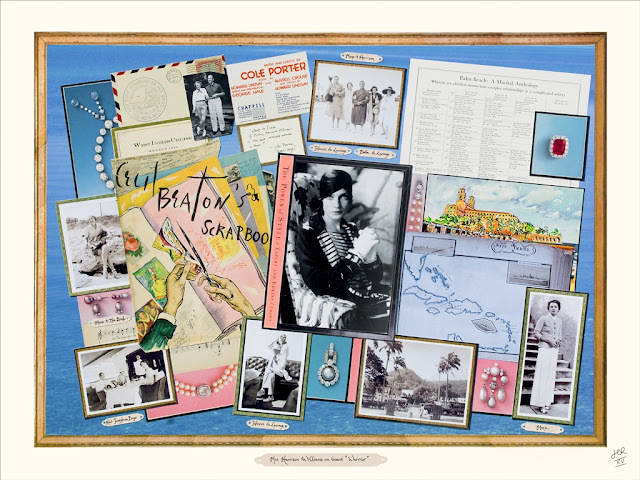 Lyford Cay-based collage artist Jean-Charles de Ravenel will be making his Palm Beach professional debut with an upcoming exhibit at Lindroth Design, designer Amanda Lindroth's charming Palm Beach design studio and shop. 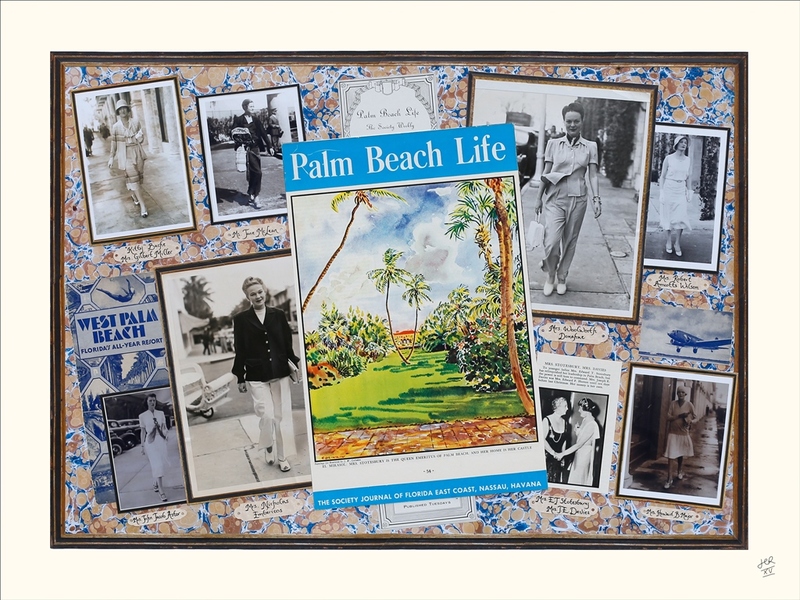 On display will be the artist's "Palm Beach Series" of collages, which celebrate the rich social history of this Florida resort town. 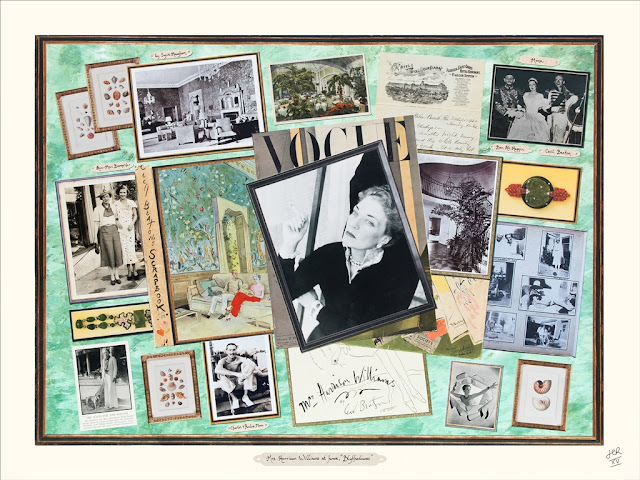 Look closely at the images seen here- just a few of the many collages that will be featured- and you'll see references to such Palm Beach luminaries as Mr. and Mrs. Winston Guest, Mrs. Harrison Williams, Addison Mizner, John L. Volk, Laddie Sanford, Mrs. Woolworth Donahue, and more. 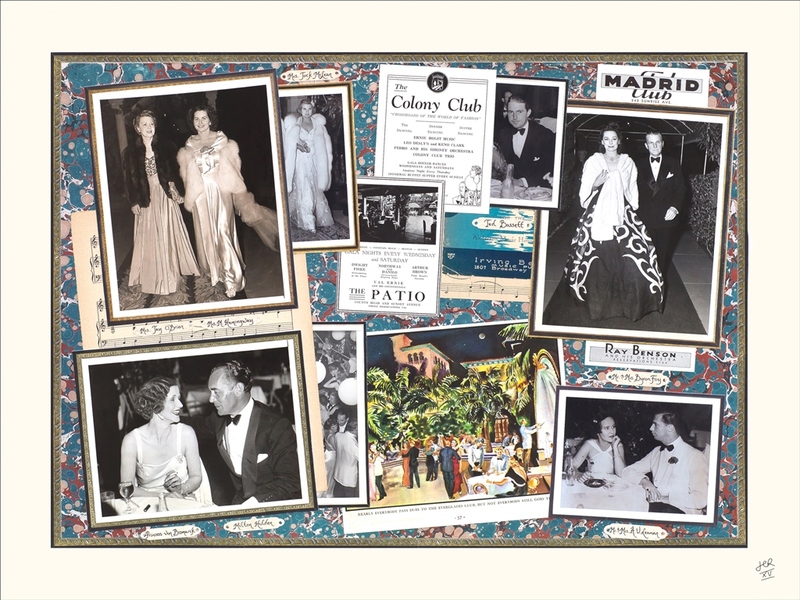 Featuring period photos, press clippings, and other mementos, these inspired collages present an intriguing chronicle of life in old Palm Beach. The exhibition runs from Friday, February 12 through April. 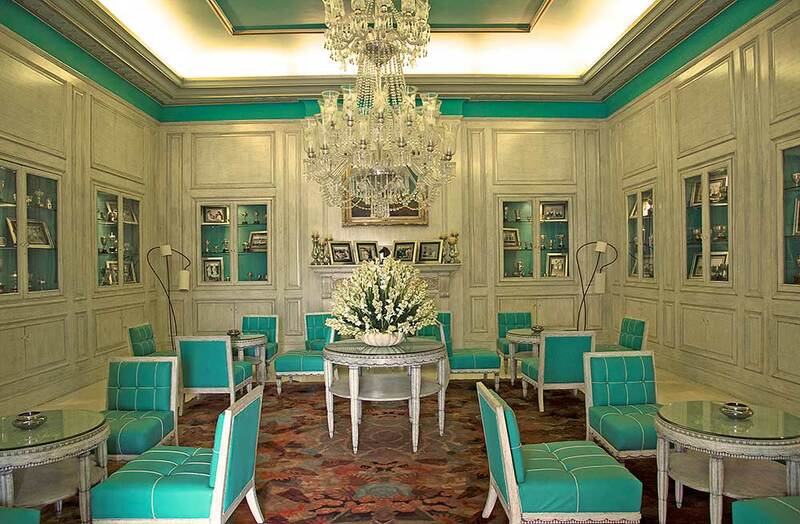 For more information or sales inquiries, please contact Lindroth Design's Palm Beach location. 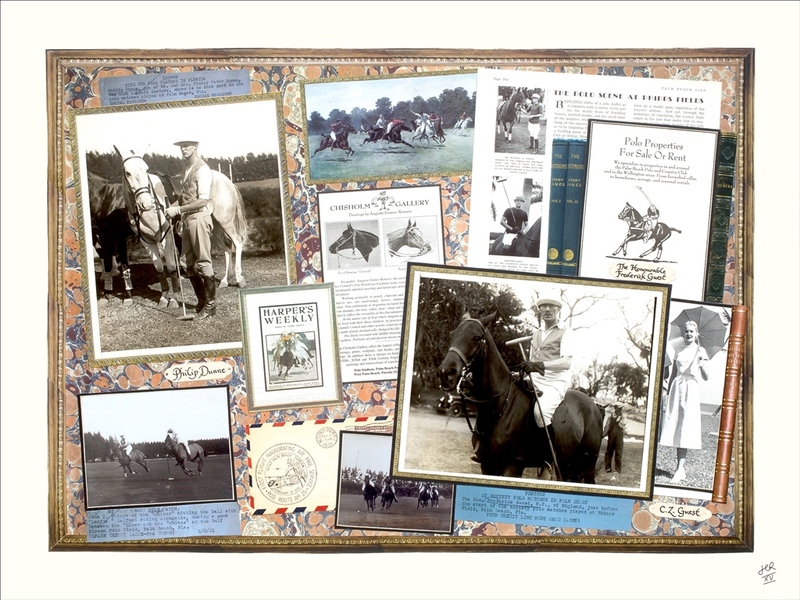 Mrs. Harrison Williams on board "Warrior"
Mrs. Harrison Williams at home "Blythedunes"
In need of a mid-week pick-me-up? 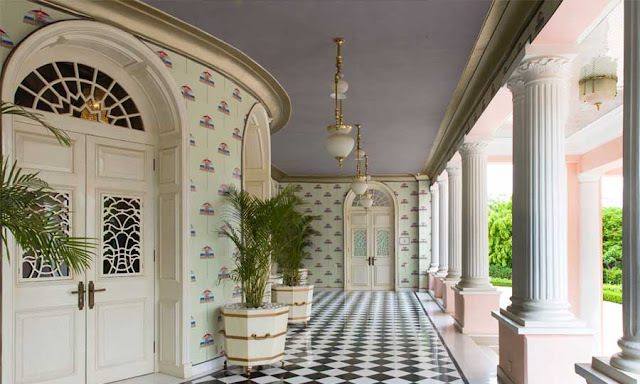 Then feast your eyes on the Suján Rajmahal Palace, the luxury Jaipur hotel whose energizing interiors- refreshing blues, pulsating pinks, and pattern galore- are sure to give you a visual start. A welcome respite from those ho hum and humdrum hotels, the Suján reminds me of Dorothy Draper and her work at The Carlyle, the Quitandinha, and The Greenbrier- minus the Suján's Indian flair, of course. 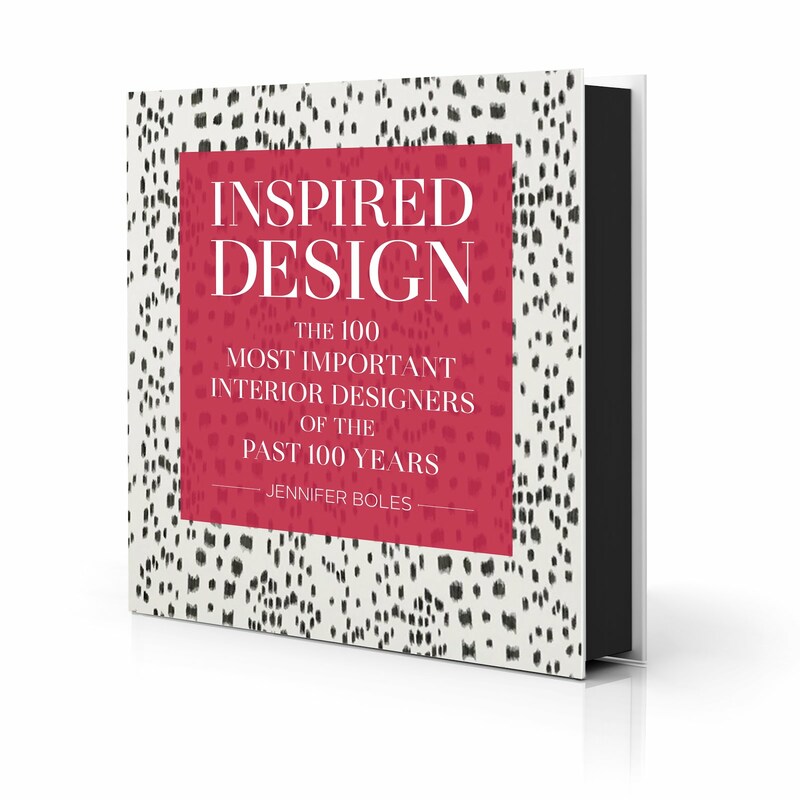 Draper understood the power of making a decorative statement, especially at hotels and restaurants. After all, who wants to embark on a night on the town or a weekend getaway, only to be greeted by bland décor? 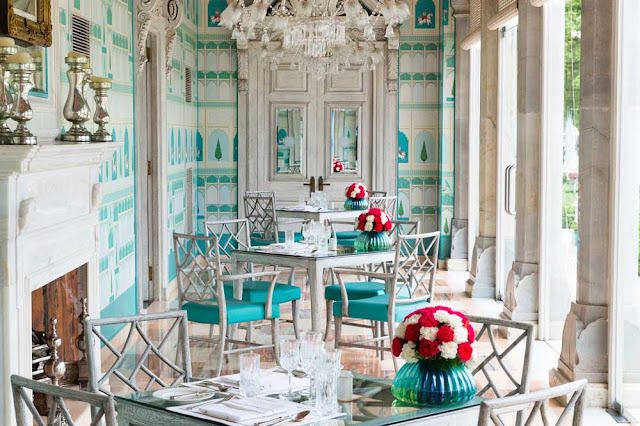 On these occasions, guests want a break from the everyday, something Draper afforded to many through her high-style and, at times, whimsically-inclined interiors. 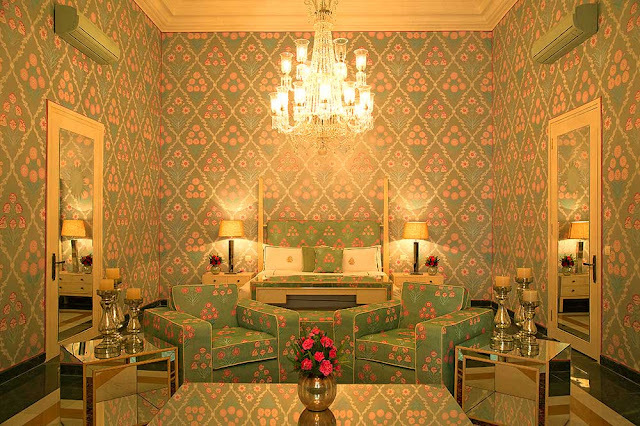 Like Draper, Carleton Varney understands people's desire for an escape from the ordinary, as evidenced by his colorful work at The Greenbrier and the Colony Hotel. And so, too, does Adhil Ahmad, the designer responsible for the Suján's interiors. 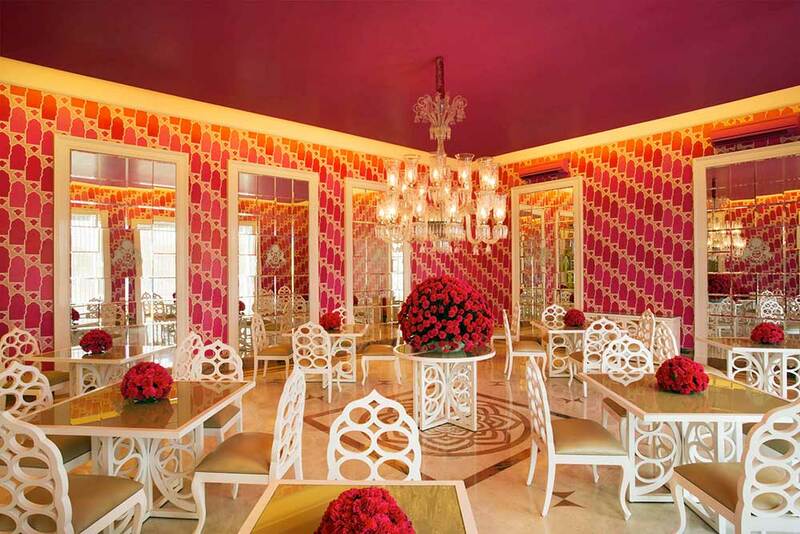 I wouldn't necessarily want my dining room to have magenta wallpaper and a purple ceiling (see below,) but oh, how much fun it would be to spend an evening in just such a room! 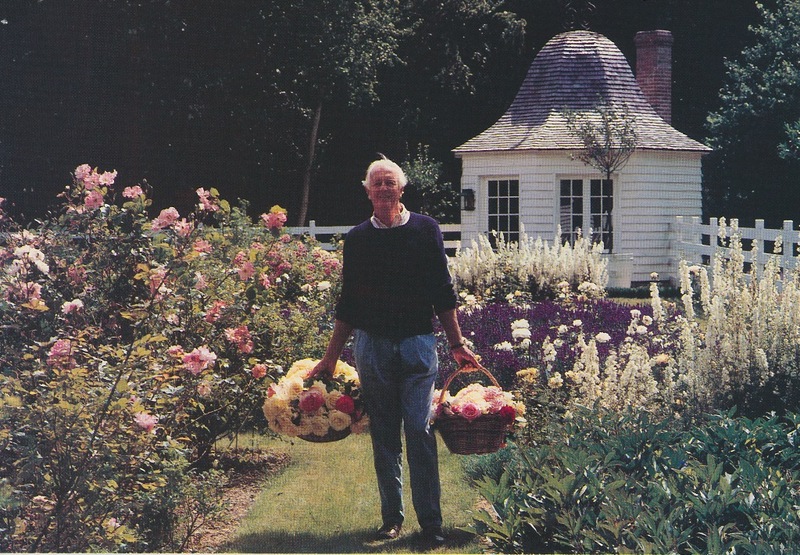 "I dress the garden with a new look each season- just like a collection." 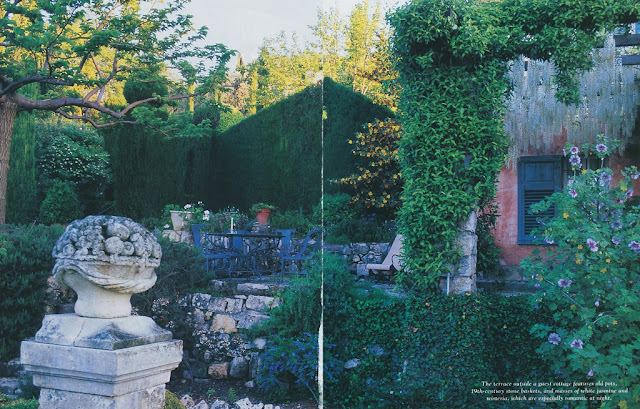 So said Hubert de Givenchy, whose gardens at Le Jonchet, his 16th-century chateau near Paris, appear to be a slice of verdant heaven. 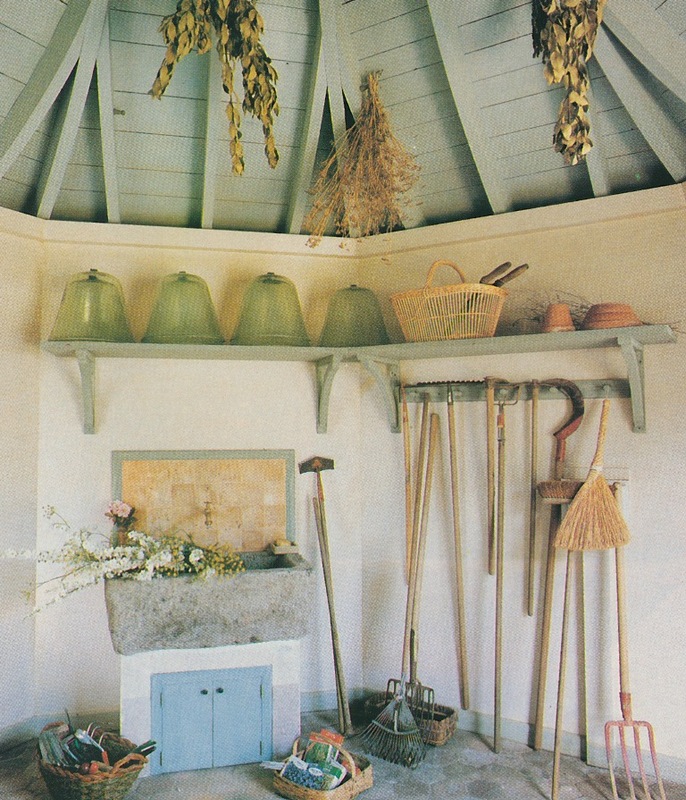 Back in the mid-1990s, one of those new looks entailed the building of a new potager, or kitchen garden. Givenchy's first potager, seen below in image number two, had been inspired by Venice. 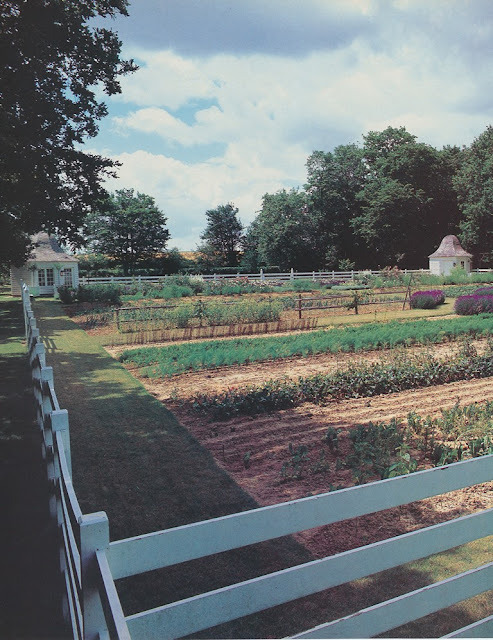 But for his subsequent potager, the designer sought inspiration in a classic American setting: George Washington's garden at Mount Vernon. 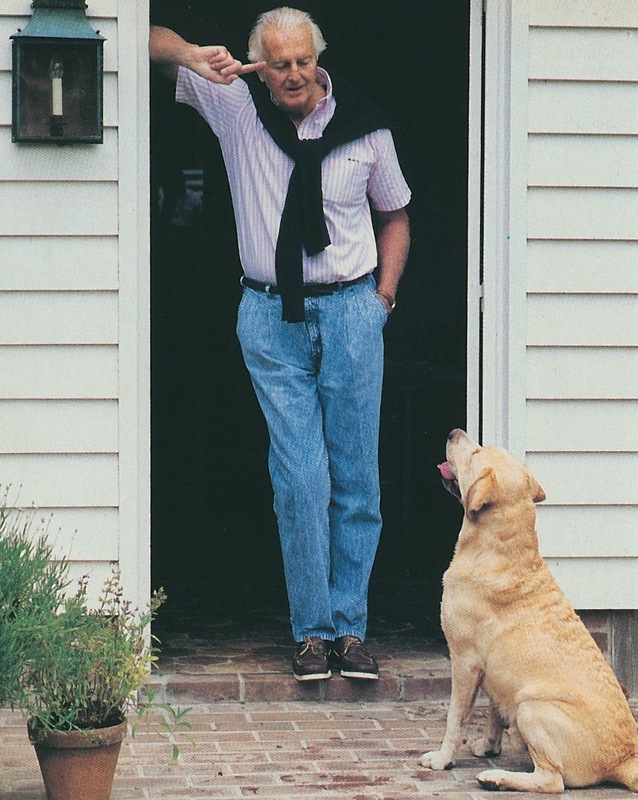 Whenever Givenchy visited his great friend, Bunny Mellon, the two made a habit of visiting Mount Vernon. Those trips made a great impact on the designer, who later fashioned his potager's two pavilions and fencing after those at Mount Vernon. 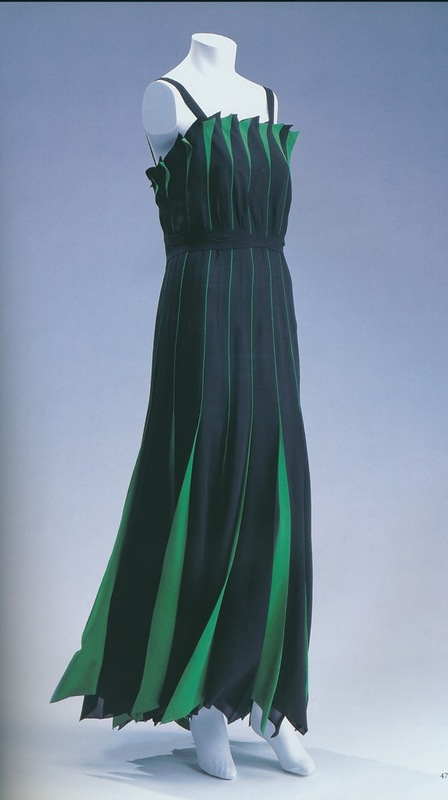 As Givenchy explained, "I adore America and the idea of having a little bit of American perfection at Le Jonchet.". It might be the pair of pavilions that I find most charming; in fact, I feature one of the pavilions in my "In with the Old" slide presentation. 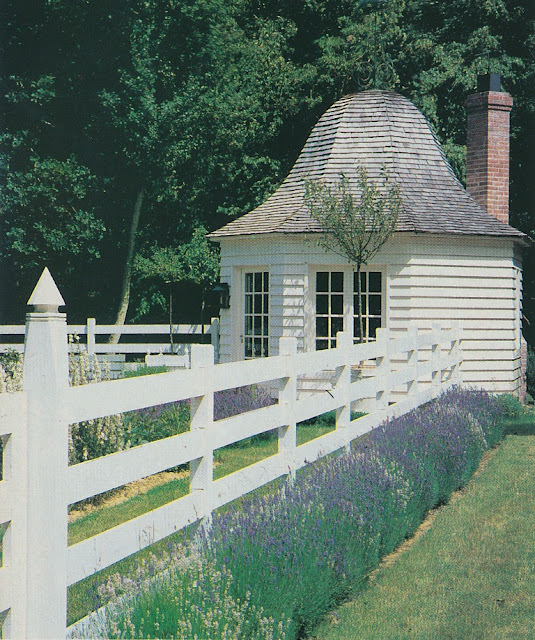 While one pavilion was intended for use by the head gardener, the other was built for the designer's personal use. 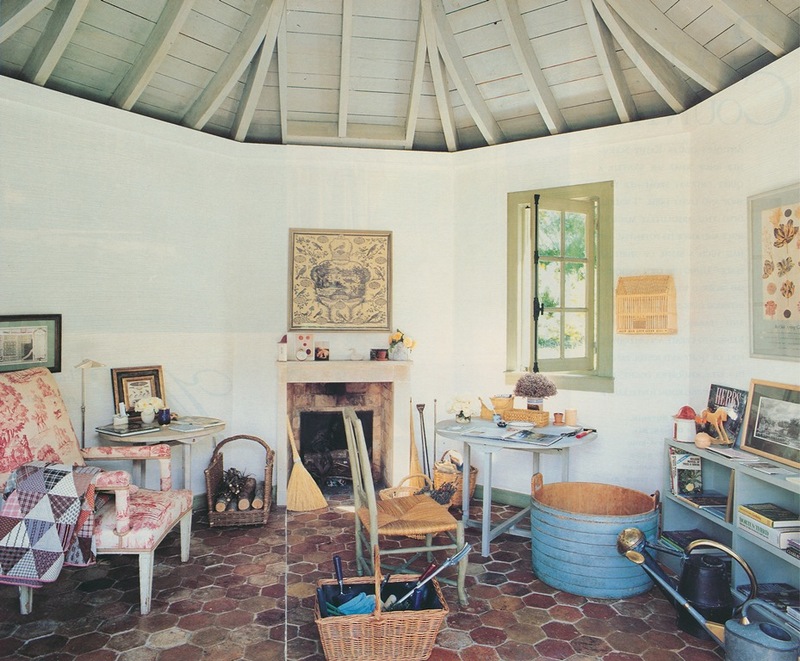 That one is filled with elegant-yet-rustic furniture, gardening tools, and books. "Each little thing in my pavilion comes from a trip and is something I love," said Givenchy. In his then-new potager, Givenchy chose board fences like those at Mount Vernon. Above, the head gardener's pavilion. The unique curved bench is a replica of one at Cawdor Castle, Scotland. The view of the lake from the pool house. All images from House Beautiful, Christopher Simon Sykes photographer.